The Davis Vantage Vue Weather Station brings together Davis’ well-known accuracy and durability into a stream-lined weather station that is accurate, simple to set up, and easy to use. 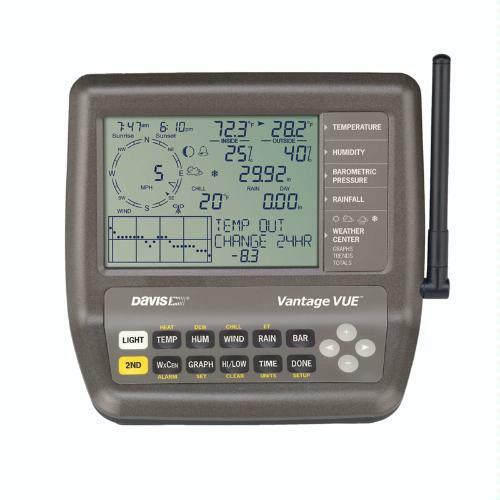 The Davis Vantage Vue 6250 consists of a slick but durable outside sensor array and unique LCD console. Like many weather stations, it checks and measures current weather conditions such as temperature, humidity, wind direction and velocity, rainfall, barometric pressure, and dew point. In addition, the Davis Vantage Vue will also give you measurements for wind chill, moon phase, a 12 hour forecast, and more. The great looking console showcases moon phase icons, weather forecast icons, sunrise and sunset times, weather trend graphs, alarms and other relevant weather related information. Setting up the Vantage Vue is quick and easy. It comes with clear instructions that are easy to follow and you can have the station set up and submitting data wirelessly to the console inside in no time. Reviews of the Vantage Vue 6250 are very good overall, with 68% of all customers giving this weather station 5 out of 5 stars, and 78% giving it at least 4 stars. In the weather station game, these are very good numbers. This is the best weather station we have ever owned. After a couple different LaCrosse models, we were just about to give up finding something that actually worked. The Davis Vantage Vue is great! The setup was easy and best of all, everything works! The data is accurate and we've had no problems with our weather station. We have owned a couple different weather stations...one we purchased from LaCrosse and the weather station was an Oregon Scientific. The Vantage Vlue is the only one that gives you wind speed updates every couple seconds. Davis weather stations are the best. Easy to setup and intuitive. .
We recently had 3 days of 30-40MPH sustained wind on the cape and my Vantage Vue never read above 17 miles per hour. I decided there was something wrong with it so I went out to the yard to gather it up to return, and when I touched the wind vane in broke in half. My Davis Vantage View displays winds of over 150mph, when it's not windy. And when it's blowing outside, it doesn't show any wind at all. I feel the manufacturer is trying to resolve the issues, but for the price of it the thing should work without a problem.